Tetrafluoroethane (a haloalkane) is a clear liquid which boils well below room temperature (as seen here) and can be extracted from common canned air canisters by simply inverting them during use. The haloalkanes (also known as halogenoalkanes or alkyl halides) are a group of chemical compounds, consisting of alkanes, such as methane or ethane, with one or more halogens linked, such as chlorine or fluorine, making them a type of organic halide. They are known under many chemical and commercial names. As fire extinguishants, propellants and solvents they have or had wide use. Some haloalkanes (those containing chlorine or bromine) have negative effects on the environment such as ozone depletion. The most widely known family within this group are the chlorofluorocarbons (CFCs). A haloalkane also known as alkyl halogenide, halogenalkane or halogenoalkane, and alkyl halide is a chemical compound derived from an alkane by substituting one or more hydrogen atoms with halogen atoms. Substitution with fluorine, chlorine, bromine and iodine results in fluoroalkanes, chloroalkanes, bromoalkanes and iodoalkanes, respectively. Mixed compounds are also possible, the best-known examples being the chlorofluorocarbons (CFCs) which are mainly responsible for ozone depletion. Haloalkanes are used in semiconductor device fabrication, as refrigerants, foam blowing agents, solvents, aerosol spray propellants, fire extinguishing agents, and chemical reagents. Freon is a trade name for a group of chlorofluorocarbons used primarily as a refrigerant. The word Freon is a registered trademark belonging to DuPont. There are 3 types of haloalkane. In primary (1°) haloalkanes the carbon which carries the halogen atom is only attached to one other alkyl group. However CH3Br is also a primary haloalkane, even though there is no alkyl group. In secondary (2°) haloalkanes the carbon that carries the halogen atom is attached to 2 alkyl groups. In tertiary (3°) haloalkanes the carbon that carries the halogen atom is attached to 3 alkyl groups. 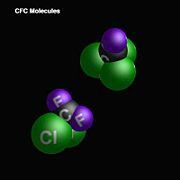 Chlorofluorocarbons (CFC) are haloalkanes with both chlorine and fluorine. They were formerly used widely in industry, for example as refrigerants, propellants, and cleaning solvents. Their use has been regularly prohibited by the Montreal Protocol, because of effects on the ozone layer (see ozone depletion). Hydrochlorofluorocarbons (HCFCs) are of a class of haloalkanes where not all hydrogen has been replaced by chlorine or fluorine. They are used primarily as chlorofluorocarbon (CFC) substitutes, as the ozone depleting effects are only about 10% of the CFCs. The compounds range at room temperature from gasses like carbon tetrafluoride to chemically liquids used for cleaning electronic parts, such as perfluoroheptane, to solids with unusual chemical and adhesive properties, such as perfluoropolyethylene (Teflon). As noted above, the gasseous and liquid PFC's are regulated as greenhouse gases, but are not regulated as ozone-destroyers. Chlorinated or fluorinated alkenes can be used for polymerization, resulting in polymer haloalkanes with notable chemical resistance properties. Important examples include polychloroethene (polyvinyl chloride, PVC), and polytetrafluoroethylene (PTFE, Teflon), but many more halogenated polymers exist. Carbon tetrachloride was used in fire extinguishers and glass "anti-fire grenades" from the late nineteenth century until around the end of World War II. Experimentation with chloroalkanes for fire suppression on military aircraft began at least as early as the 1920s. American engineer Thomas Midgley developed chlorofluorocarbons (CFC) in 1928 as a replacement for ammonia (NH3), chloromethane (CH3Cl), and sulfur dioxide (SO2), which are toxic but were in common use at the time as refrigerants. The new compound developed had to have a low boiling point and be non-toxic and generally non-reactive. In a demonstration for the American Chemical Society, Midgley flamboyantly demonstrated all these properties by inhaling a breath of the gas and using it to blow out a candle. Midgley specifically developed CCl2F2. However, one of the attractive features is that there exists a whole family of the compounds, each having a unique boiling point which can suit different applications. In addition to their original application as refrigerants, chlorofluoroalkanes have been used as propellants in aerosol cans, cleaning solvents for circuit boards, and blowing agents for making expanded plastics (such as the expanded polystyrene used in packaging materials and disposable coffee cups). During World War II, various early chloroalkanes were in standard use in military aircraft by some combatants, but these early halons suffered from excessive toxicity. Nevertheless, after the war they slowly became more common in civil aviation as well. In the 1960s, fluoroalkanes and bromofluoroalkanes became available and were quickly recognized as being among the most effective fire-fighting materials discovered. Much early research with Halon 1301 was conducted under the auspices of the US Armed Forces, while Halon 1211 was, initially, mainly developed in the UK. By the late 1960s they were standard in many applications where water and dry-powder extinguishers posed a threat of damage to the protected property, including computer rooms, telecommunications switches, laboratories, museums and art collections. Beginning with warships, in the 1970s, bromofluoroalkanes also progressively came to be associated with rapid knockdown of severe fires in confined spaces with minimal risk to personnel. Work on alternatives for chlorofluorocarbons in refrigerants began in the late 1970s after the first warnings of damage to stratospheric ozone were published in the journal Nature in 1974 by Molina and Rowland (who shared the 1995 Nobel Prize for Chemistry for their work). Adding hydrogen and thus creating hydrochlorofluorocarbons (HCFC), chemists made the compounds less stable in the lower atmosphere, enabling them to break down before reaching the ozone layer. Later alternatives dispense with the chlorine, creating hydrofluorocarbons (HFC) with even shorter lifetimes in the lower atmosphere. By the early 1980s, bromofluoroalkanes were in common use on aircraft, ships and large vehicles as well as in computer facilities and galleries. However, concern was beginning to be felt about the impact of chloroalkanes and bromoalkanes on the ozone layer. The Vienna Convention on Ozone Layer Protection did not cover bromofluoroalkanes as it was thought, at the time, that emergency discharge of extinguishing systems was too small in volume to produce a significant impact, and too important to human safety for restriction. However, by the time of the Montreal Protocol it was realised that deliberate and accidental discharges during system tests and maintenance accounted for substantially larger volumes than emergency discharges, and consequently halons were brought into the treaty, albeit with many exceptions. Use of certain chloroalkanes as solvents for large scale application, such as dry cleaning, have been phased out, for example, by the IPPC directive on greenhouse gases in 1994 and by the Volatile Organic Compounds (VOC) directive of the EU in 1997. Permitted chlorofluoroalkane uses are medicinal only. Finally, bromofluoroalkanes have been largely phased out and the possession of such equipment is prohibited in some countries like the Netherlands and Belgium, from January 1, 2004, based on the Montreal Protocol and guidelines of the European Union. Production of new stocks ceased in most (probably all) countries as of 1994. However many countries still require aircraft to be fitted with halon fire suppression systems because no safe and completely satisfactory alternative has been discovered for this application. There are also a few other, highly specialised, uses. These programs recycle halon through "halon banks" coordinated by the Halon Recycling Corporation to ensure that discharge to the atmosphere occurs only in a genuine emergency and to conserve remaining stocks. The formal naming of haloalkanes should follow IUPAC nomenclature, which put the halogen as a prefix to the alkane. For example, ethane with bromine becomes bromoethane, methane with four chlorine groups becomes tetrachloromethane. However, many of these compounds have already an established trivial name, which is endorsed by the IUPAC nomenclature, for example chloroform (trichloromethane) and methylene chloride (dichloromethane). For unambiguity, this article follows the systematic naming scheme throughout. a = Letter added to identify isomers, the "normal" isomer in any number has the smallest mass difference on each carbon, and a, b, or c are added as the masses diverge from normal. Other coding systems are in use as well. This table gives an overview of most haloalkanes in general use or commonly known. Listing includes bulk commodity products as well as laboratory chemicals. Alkyl halides can be synthesized from alkanes, alkenes, or alcohols. Steps 2 and 3 keep repeating, each providing the reactive intermediate needed for the other step. This is called a radical chain reaction. This reaction continues until the radicals are used up by one of three termination steps. Note that Step 4 results in the same product as Step 3, the desired haloalkane, but through the destruction of two radicals. Step 5 is just the reverse of Step 1 and Step 6 accounts for the small contamination of this reaction by larger alkanes and their subsequent haloalkanes. H3C-CH=CH2 + HBr → H3C-CHBr-CH3 (primary product) + H3C-CH2-CH2Br (secondary product). Water must be absent otherwise there will be a side product( water). The reaction is necessarily to be carried out in a dry inert solvent such as CCl4 or directly in the gaseous phase. Haloalkanes are reactive towards nucleophiles. They are polar molecules: the carbon to which the halogen is attached is slightly electropositive where the halogen is slightly electronegative. This results in an electron deficient (electrophilic) carbon which, inevitably, attracts nucleophiles. Substitution reactions involve the replacement of the halogen with another molecule - thus leaving saturated hydrocarbons, as well as the halogen product. Hydrolysis—a reaction in which water breaks a bond—is a good example of the nucleophilic nature of halogenoalkanes. The polar bond attracts a hydroxide ion, OH-. (NaOH(aq) being a common source of this ion). This OH- is a nucleophile with a clearly negative charge, as it has excess electrons it donates them to the carbon, which results in a covalent bond between the two. Thus C-X is broken by heterolytic fission resulting in a halide ion, X-. As can be seen, the OH is now attached to the alkyl group, creating an alcohol. (Hydrolysis of bromoethane, for example, yields ethanol). One should note that within the halogen series, the C-X bond weakens as one goes to heavier halogens, and this affects the rate of reaction. Thus, the C-I of an iodoalkane generally reacts faster than the C-F of a fluoroalkane. Ammonia (NH3) and bromoethane yields a mixture of ethylamine, diethylamine, and triethylamine (as their bromide salts), and tetraethylammonium bromide. Cyanide (CN-) added to bromoethane will form propionitrile (CH3CH2CN), a nitrile, and Br-. Nitriles can be further hydrolyzed into carboxylic acids. Rather than creating a molecule with the halogen substituted with something else, one can completely eliminate both the halogen and a nearby hydrogen, thus forming an alkene. For example, with bromoethane and NaOH in ethanol, the hydroxide ion OH- attracts a hydrogen atom - thus removing a hydrogen and bromine from bromoethane. This results in C2H4 (ethylene), H2O and Br-. One major use of CFCs has been as propellants in aerosol inhalers for drugs used to treat asthma. The conversion of these devices and treatments from CFC to halocarbons that do not have the same effect on the ozone layer is well under way. The hydrofluoroalkane propellants ability to solubilize medications and excipients is markedly different from CFCs and as a result require a considerable amount of effort to reformulate. (a significant amount of development effort has also been required to develop non-CFC alternatives to CFC-based refrigerants, particularly for applications where the refrigeration mechanism cannot be modified or replaced.) They have now been outlawed in all 50 U.S. states universally. At high temperatures, halons decompose to release halogen atoms that combine readily with active hydrogen atoms, quenching the flame propagation reaction even when adequate fuel, oxygen and heat remains. The chemical reaction in a flame proceeds as a free radical chain reaction; by sequestering the radicals which propagate the reaction, halons are able to "poison" the fire at much lower concentrations than are required by fire suppressants using the more traditional methods of cooling, oxygen deprivation, or fuel dilution. For example, Halon 1301 total flooding systems are typically used at concentrations no higher than 7 percent v/v in air, and can suppress many fires at 2.9 percent v/v. By contrast, carbon dioxide fire suppression flood systems are operated from 34 percent concentration by volume (surface-only combustion of liquid fuels) up to 75 percent (dust traps). Carbon dioxide can cause severe distress at concentrations of 3 to 6 percent, and has caused death by respiratory paralysis in a few minutes at 10 percent concentration. Halon 1301 causes only slight giddiness at its effective concentration of 5 percent, and even at 15 percent persons remain conscious but impaired and suffer no long term effects. (Experimental animals have also been exposed to 2 percent concentrations of Halon 1301 for 30 hours per week for 4 months, with no discernible health effects at all.) Halon 1211 also has low toxicity, although it is more toxic than Halon 1301, and thus considered unsuitable for flooding systems. However, Halon 1301 fire suppression is not completely non-toxic; very high temperature flame, or contact with red-hot metal, can cause decomposition of Halon 1301 to toxic byproducts. The presence of such byproducts is readily detected because they include hydrobromic acid and hydrofluoric acid, which are intensely irritating. Halons are very effective on Class A (organic solids), B (flammable liquids and gases) and C (electrical) fires, but they are totally unsuitable for Class D (metal) fires, as they will not only produce toxic gas and fail to halt the fire, but in some cases pose a risk of explosion. Halons can be used on Class K (kitchen oils and greases) fires, but offer no advantages over specialised foams. Halon 1211 is typically used in hand-held extinguishers, in which a stream of liquid halon is directed at a smaller fire by a user. The stream evaporates under reduced pressure, producing strong local cooling, as well as a high concentration of halon in the immediate vicinity of the fire. In this mode, extinguishment is achieved by cooling and oxygen deprivation at the core of the fire, as well as radical quenching over a larger area. After fire suppression, the halon moves away with the surrounding air, leaving no residue. Flooding systems may be manually operated or automatically triggered by a VESDA or other automatic detection system. In the latter case, a warning siren and strobe lamp will first be activated for a few seconds to warn personnel to evacuate the area. The rapid discharge of halon and consequent rapid cooling fills the air with fog, and is accompanied by a loud, disorienting noise. Due to environmental concerns, alternatives are being deployed. Halon 1301 is also used in the F-16 fighters to prevent the fuel vapors in the fuel tanks from becoming explosive; when the aircraft enters area with the possibility of unfriendly fire, Halon 1301 is injected into the fuel tanks for one-time use. Due to environmental concerns, trifluoroiodomethane (CF3I) is being considered as an alternative. Since the chlorine is regenerated at the end of these reactions, a single Cl atom can destroy many thousands of ozone molecules. Reaction schemes similar to this one (but more complicated) are believed to be the cause of the ozone hole observed over the poles and upper latitudes of the Earth. Decreases in stratospheric ozone may lead to increases in skin cancer. In 1975, the US state of Oregon enacted the world's first ban of CFCs (legislation introduced by Walter F. Brown). The United States and several European countries banned the use of CFCs in aerosol spray cans in 1978, but continued to use them in refrigeration, foam blowing, and as solvents for cleaning electronic equipment. By 1985, scientists observed a dramatic seasonal depletion of the ozone layer over Antarctica. International attention to CFCs resulted in a meeting of world diplomats in Montreal in 1987. They forged a treaty, the Montreal Protocol, which called for drastic reductions in the production of CFCs. On March 2, 1989, 12 European Community nations agreed to ban the production of all CFCs by the end of the century. In 1990, diplomats met in London and voted to significantly strengthen the Montreal Protocol by calling for a complete elimination of CFCs by the year 2000. By the year 2010 CFCs should be completely eliminated from developing countries as well. Because the only available CFC gases in countries adhering to the treaty is from recycling, their prices have gone up considerably. A worldwide end to production should also terminate the smuggling of this material, such as from Mexico to the United States. A number of substitutes for CFCs have been introduced. 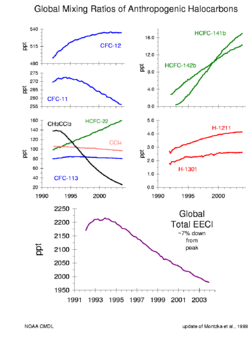 Hydrochlorofluorocarbons (HCFCs) are much more reactive than CFCs, so a large fraction of the HCFCs emitted break down in the troposphere, and hence are removed before they have a chance to affect the ozone layer. Nevertheless, a significant fraction of the HCFCs do break down in the stratosphere and they have contributed to more chlorine buildup there than originally predicted. Development of non-chlorine based chemical compounds as a substitute for CFCs and HCFCs continues. One such class are the hydrofluorocarbons (HFCs), which contain only hydrogen and fluorine. One of these compounds, HFC-134a, is now used in place of CFC-12 in automobile air conditioners. There is concern that halons are being broken down in the atmosphere to bromine, which reacts with ozone, leading to depletion of the ozone layer (this is similar to the case of chlorofluorocarbons such as freon). These issues are complicated: the kinds of fires that require halon extinguishers to be put out will typically cause more damage to the ozone layer than the halon itself, not to mention human and property damage. However, fire extinguisher systems must be tested regularly, and these tests may lead to damage. As a result, some regulatory measures have been taken, and halons are being phased out in most of the world. In the United States, purchase and use of freon gases is regulated by the Environmental Protection Agency, and substantial fines have been levied for their careless venting. Also, licenses, good for life, are required to buy or use these chemicals. The EPA website discusses these rules in great detail, and also lists numerous private companies that are approved to give examinations for these certificates. There are two kinds of licenses. Obtaining a "Section 609" license to use CFCs to recharge old (pre-1993 model year) car air conditioners is fairly easy and requires only an online multiple choice test offered by several companies. Companies that use unlicensed technicians for CFC recharge operations are subject to a US$15,000 fine per technician by the EPA. The "Section 608" license, needed to recharge CFC-using stationary and non-automobile mobile units, is also multiple choice but more difficult. A general knowledge test is required, plus separate exams for small size (such as home refrigerator) units, and for high and low pressure systems. These are respectively called Parts I, II, and III. A person who takes and passes all tests receives a "Universal" license; otherwise, one that is endorsed only for the respectively passed Parts. While the general knowledge and Part I exams can be taken online, taking them before a proctor (which has to be done for Parts II and III) lets the applicant pass these tests with lower scores. Haloalkanes in copper tubing open to the environment can turn into phosgene gas after coming in contact with extreme heat, such as while brazing or in a fire situation. Other ways that phosgene can be created is by passing the Haloalkane through an internal combustion engine, or by inhaling it through a lit cigarette, cigar or pipe. Phosgene is a substance that was used as a chemical weapon in World War I. Low exposure can cause irritation, but high levels cause fluid to collect in the lungs, possibly resulting in death. ↑ .www.halom.org.Retrieved March 13, 2008. ↑ .Retrieved March 13, 2008. ↑ Defense Tech Briefs .Retrieved March 13, 2008. B. S. Furnell et al., Vogel's Textbook of Practical Organic Chemistry, 5th edition, Longman/Wiley, New York, 1989. Lerner, K. Lee Brenda Wilmoth Lerner, eds. Environmental issues: essential primary sources. Detroit: Thomson Gale, 2006. Moeller, Dade W. 2005. Environmental Health, 3rd ed. Cambridge, MA: Harvard University Press. ISBN 0674014944. Morrison, Robert T., and Robert N. Boyd. 1992. Organic Chemistry,'. 6th ed. Englewood Cliffs, NJ: Prentice Hall. ISBN 0136436692. This page was last modified on 25 July 2017, at 21:22.